Henna + healing. Art + vibrational medicine. Passover Shabbat Seder. public Zikr. Visioned by Ibahim Baba + Taya Mâ. The Power of the Written Word w/ Aliya Choudhery - Explore mystical traditions of the written word in Hebrew, Arabic and Farsi. We'll begin with a simple overview spanning Paleolithic script until script that we know now. Participants will be given tools to scribe a sacred word or phrase in Hebrew, Arabic and Farsi, to bring to their home altars. Aliya is particularly excited to include Farsi in this exploration because Ibrahim Baba was passionate about non-Arabized script and pronunciations as seen throughout the Islamic experience. Henna, Herstory & Healing w/ Aliya Choudhery - We'll immerse in the herstory and significance of henna plant and the dye as used in ritual, ceremony and gatherings in Sufi and Jewish custom and beyond. We'll be guided in using henna to enhance our own sacred ceremonial intentions and will practice basic strokes when applying it. The henna we'll play and pray with is organic & sourced in Oakland. Cultivating Vibrational States & Engaging the Power of Inner Attunement w/ Hasnaa Tauhidi - We each have an optimal state of being that is in accord with our most authentic self. When we're in this divine attunement, life flows with ease, we're receptive to our guidance, and we surrender to flow. In this session we'll engage Sufi teachings on the alchemy of sound and explore resonance and synchronicity as indicators of attunement. We'll play with the power of personal frequency and cultivate tools for returning alignment with our highest good. Hazrati Mariem and the Veil of Contemplation w/ Matta El Meskeen - We'll look at ancient Christian and Islamic sources to explore the secret of Mariem and her example as she puts the veil of contemplation between herself and all that is familiar, entering into the unknown and the Kashf/unveiling of Divine Mystery. We'll examine her image - a universal Kohenet / Priestess of stillness and silent transformation in Judaism becomes a motherly sweet and fierce figure for the sacred feminine / Sakina among Christians and Muslims. We will ask Mariem to initiate us into her path so that we may become, like her, Divine-bearers, and contribute with our actions to the transformed world of Yemot HaMashiach/Al Mahdi. We gather at the Ateshi Ashk Derga in East Oakland, CA (Address upon Registration). Saturday evening zikr is at Mahea Uchiyama Center for International Dance / 729 Heinz Avenue / Berkeley, CA and is open to the public. Registration Opens April 1, 2016 / Registration fees is $125. We want to make this gathering as accessible as possible - the registration fee covers retreat costs for food, travel, supplies, space, etc. Some sliding scale is available as needed, just ask. Saturday evening zikr is open to the public. The weekend retreat is designed as an immersive learning, practice and community-building experience for Makam Shekhina - Ateshi Ashk dervishes, Kohenet Hebrew Priestesses and resonant friends. If you are new to our circles, please include a paragraph application of what draws you to this gathering along with your registration. Aliya Choudhery is a sound & visual artist and urban alchemist working with cultural expressions of mystic arts, movement and ritual. Aliya is dedicated to the compilation and revival of Islamic esoterica and the Feminine. A former Muslim activist, she has always been passionate about working at the intersection of Jews, Muslims and Christians, a passion anchored in strong past/concurrent life memories in Southern Spain, during a time in which tremendous beauty and gifts were birthed through powerful co-creation. Such an alignment with the visions of Makam Shekhinah! Aliya fell into Sufism through the portal of the Hebrew alphabet. As an initiate within the Hermetic Qabbalah mysteries where extensive emphasis is placed on the written Hebrew word, Aliya naturally brought the Arabic alphabet into the equation. Reflection between the two alphabets is a core focus in Aliya’s revival research on Islamic esoterica as well as her creative work. Aliya currently resides in Los Angeles and is working on the production of her first EP, to be released under a project alias. Hasnaa Tauhidi has been immersed in a world of mysticism, ceremony and celebration since before she was born. She found her calling teaching others how to embody their higher self and their soul’s purpose. Born a clairsentient, she has learned the importance of living in alignment with one’s intuition and most divine self. Hasnaa uses her gifts to remind people of the vibrational, energetic nature of this universe. She dances in the realms of metaphysics, quantum law, spiritual law, ceremony, ritual, reincarnation and meditation. She specializes in helping people honor their soul's highest purpose and their pre-birth plan. Hasnaa incorporates ancient knowledge as well as cutting edge information to intuitively create a program for her clients that will awaken their potential and create deep transformational healing. 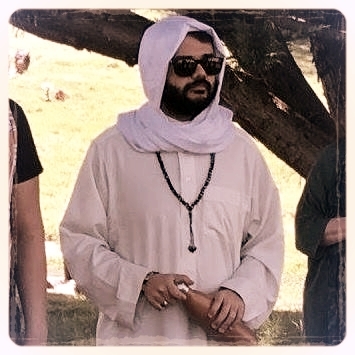 Matta El Meskeen is a Queer Egyptian of Coptic descent and a madly-devout student of Sufism and the path of Ashq/Love. He fell in love with the Beloved and his heart was cracked-open with the call to Oneness of La Ilaha Ila Allah, which led him to take Shehada with Pir Ibrahim Baba, and to initiation in the Chishti Lineage. Like his beloved Sheikh, Matta believes his calling is to contribute to Islamic Tajdid/Renewal while connecting the dots between Mizrahi Jewish, Eastern Christian and Islamic Sufi spirituality. He has undergraduate degrees in Psychology, Religious Studies, and Gerontology, and is currently working on his Master of Divinity and MA at the Graduate Theological Union.